I'm always shocked by how expensive soap is. especially dishwasher soap. maybe because I grew up washing dishes in a sink, not in a dishwasher? quick googling brought me oodles of suggestions. 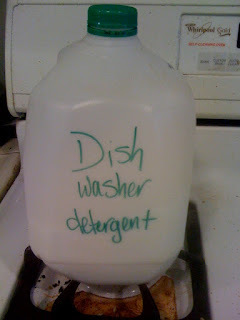 My dad, who occasionally does his laundry at our house, has us pretty well stocked with laundry detergent, but we ran out of dishwasher detergent on monday, so I immediately set to work locating the ingredients. erg. I thought the borax would be hard to find, as I've never seen it before, but that was easily located in the laundry/cleaning aisle of Albertsons, (my normal grocery shopping routine of costco/farmers market/trader joes/whole foods was obviously going to be inadequate for these purchases, although, actually, I DID get the vinegar at Costco). Washing Soda.... I can't find this stuff... I plan on trying target or home depot today (I assume both of these places will be open on Veteran's Day? come on, stay at home moms whose husbands work NEED somewhere to go on vets day, given the closure of libraries, disneyland (ok, not closed, but our passes don't work), aquariums, etc.) . I even ventured into Smart n Final, which has only happened maybe once before in my life... no luck. so I bought 10lbs of baking soda, and came home to make it work. D helped measure and pour (his FAVORITE kitchen tasks), following THIS recipe (because it calls for baking soda, not washing soda. I used it yesterday and it TOTALLY worked! woohoo!